In the realm of impact wrenches, Hammerhead Tools is sort of a dark horse relative to the competition. For one thing, you’ve probably never heard of them because they aren’t widespread and aren’t commonly found in major stores. However, when it comes to quality, they are right up there with Dewalt, Milwaukee, and Makita. When it comes to price? They are significantly cheaper. All these facts combined means that we think they are going to grow in the near future. They are available at some of the major online retailers, and with a 20 year history in the industry, it is likely that they will continue to hit home runs when it comes to tool design. In addition, with their wide range of tool types ranging from battery powered screwdrivers to hammer drills to a smorgasbord of laser levels, they have potential for some pretty wide reach. Due to their mystique coupled with their high value, we thought it worthwhile to give the HDIW075 7.5A 1/2″ Drive Corded Impact Wrench a try to see how it fared. We are pleased to report that it fared quite well! This impact wrench has a pretty well rounded list of features, but overall is a pretty basic wrench without a ton of bells and whistles. The wrench has a cord that plugs into a 120V outlet, which means no replacing batteries and no oiling like you would have to do for air tools. Amperage is 7.5, which means you aren’t going to be tripping circuit breakers when working on your vehicle in your garage. The no load speed is variable up to 2200 rpm and at full speed this wrench achieves 2700 impacts per minute. Max torque is 240ft-lb, which is plenty for even heavy duty work such as car suspension or engine removal. Torque is transmitted through a 1/2″ square anvil, which is stout and easy to swap sockets onto. The wrench operates in forward and reverse, which is selectable by flipping an easily accessible toggle switch. The one bummer for us is that it doesn’t come with a case. Quite honestly, we’d have rather paid the extra few bucks if it were to have included a case. Nonetheless, we care for our tools pretty well so not having a case isn’t the end of the world but you will need to pay a little bit of extra attention. A case certainly would have made transportation and storage a bit easier as well. When it comes to build quality, the Hammerhead HDIW075 really starts to shine. The materials, from the all metal gear box housing to the non-slip grip are all quite good. Speaking of the non-slip grip, it’s rather comfortable and won’t beat your hands up during long periods of use. The ergonomics on the wrench are good in general, with a comfortable and easily manipulable trigger. While this wrench isn’t particularly a lightweight, it’s not heavy by any stretch. Heavy impacts tend to feel high quality but…heavy. Light weight impacts can tend to feel flimsy. Thankfully, the Hammerhead falls into neither category, striking a nice balance between maneuverability and heft. Another note about the build quality is that Hammerhead stands behind their products, as evidenced by their 3 year limited warranty. As such, you can work on your car without fear of having to replace a broken tool. The country of manufacture is China, but there is no way that a tool with similar quality is going to carry the same price tag if it were made elsewhere. Furthermore, most power tool manufacturing is outsourced overseas these days, and the tools are still being produced with acceptable quality. In short, don’t let the country of manufacture dissuade you from considering this wrench. When it comes to value, the Hammerhead Corded Impact Wrench is quite high. Sure, they don’t have the bells and whistles of some of the other guys, but you also aren’t paying the premium for these things. This wrench costs a fraction of some of the big boys and their warranty is competitive as well so there are very few drawbacks. 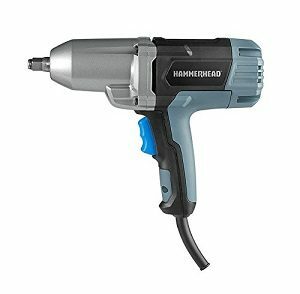 As for where to buy, Hammerhead Tools seems to sell their wrenches on Amazon exclusively at the time of this article. Fortunately Amazon is a pretty great place to buy so you’ll be in good hands. If you are curious to learn more about impact wrenches, take a look at our guide for a more in depth look at impact wrenches. You can also see more pictures, read more reviews, and see prices by clicking here!